PolyForce™ STRUCTURAL RECYCLED PLASTIC LUMBER is designed to be customized to meet individual strength and load bearing requirements for a variety of product and component needs. Based upon your specific structural requirement, PolyForce can be formulated precisely with various loading levels of reinforcing fibers and other proprietary ingredients to meet your light to medium duty commercial or industrial applications. For the most demanding structural applications, we add continuous and full length fiberglass rebar within the cross section to reach the highest strength possible to meet your component, product or overall project need. Recycled Content: PolyForce is certified to contain a minimum of 66% – 70% Recycled Content based upon the range of formulations needed to meet your structural specification. If your project benefits from recognizing Post Consumer Content we can deliver and certify a minimum of 59% – 66% Post Consumer Recycled Content pending your final formulation need. Our certifications on record meet the FTC Green Guidelines. Certification System: We back up our environmental claims by engaging Green Circle Certified who has conducted an independent, third party evaluation for "Recycled Content" for all grades of PolyForce. Certifications have been issued and are renewed on an annual basis. For more information, see CERTIFIED RECYCLED CONTENT. PolyForce™ STRUCTURAL RECYCLED PLASTIC LUMBER is designed to engineer and tailor formulations to satisfy a range of structural requirements — from light duty to the most demanding. PolyForce is stronger, stiffer and has a lower coefficient of thermal expansion and contraction than our other Recycled Plastic Lumber brands. And it is built "like a tank" for your more structural applications, while maintaining the beautiful fit and finish of our PolyTuf™ PREMIUM RECYCLED PLASTIC LUMBER. Negligible water absorption so mold and mildew cannot penetrate the surface. Resistant to most chemical exposures. Will not suffer damage from bugs, insects or barnacles underwater. Resistant to UV and harsh weather and waterfront climates. Will not leach toxins above or below waterline installations. Surface embossed finish & textures available for slip-resistance. Compatible with common woodworking tools and CNC fabrication techniques. Greater impact resistance than wood and wood fiber composites. Can be custom produced for your unique application or project for structural requirement, shape, length, and color. Environmentally friendly and certified: 66% – 70% Recycled Content or 59% – 66% Post Consumer Content based upon custom formulation. Meets FTC Green Guideline requirements. PolyForce™ STRUCTURAL RECYCLED PLASTIC LUMBER is ideal for light duty to demanding structural applications & projects within the WETLAND & WATERFRONT STRUCTURES MARKET. Growing uses are being developed for specific parts needing structural stiffness within the FABRICATED PRODUCTS MARKET since the surface finish for PolyForce matches PolyTuf™. Finally, cross bracing and various structural support parts and applications are increasing for PolyForce to penetrate the RESIDENTIAL DOCKS & PIERS MARKET which utilizes our TanDeck™ brand. Boardwalks, nature walks, fishing piers, dune crossovers – decking, hand rail & substructure. Bridge Pier Protection, - bridge fender wales, bull rails, backing beams, chocks etc. PolyForce Continuous extrusion: For quality reasons, Tangent has made the significant capital investment to continuously extrude its entire product line. This allows the production to settle in to a steady state condition, which facilitates superior process control and results in a consistent and overall higher quality finished product than alternative methods such as molding into hard tooling. Structural reinforcement: PolyForce is reinforced with customized percentages of fiberglass filaments and other proprietary additives within the recycled plastic matrix to meet your unique challenge. For the most demanding structural applications, we can add continuous full length fiberglass rebar. Co-extrusion: An external layer or “cap” encases the inside core and is comprised of the highest quality resins, pigments and UV-resistant additives; creating a durable, superior external finish with no compromises of beauty. 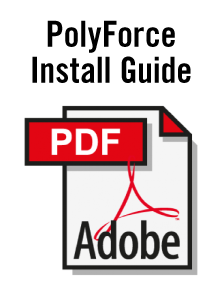 Cross-sections: PolyForce is available in a wide range of cross-sections: from typical recycled plastic lumber sizes such as 2”x4” all the way to "timber" sizes such as 12”x12”. If "sheet size" is what you need, we can provide Polyforce up to a maximum width of 60 inches. No other manufacturer can make a recycled plastic lumber sheet size profile this wide. Tangent has tooling for over one hundred cross-sections and we can add a customized shape to meet your specific needs. 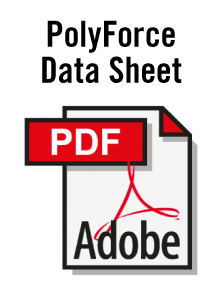 Length: PolyForce is continuously extruded. This provides a considerable range in lengths that can be offered. While 16’, 20’ and 24’ lengths are typical; other lengths can be produced, depending on the size of your order. Colors: PolyForce has no color limitations and can be produced in any standard or customized color. 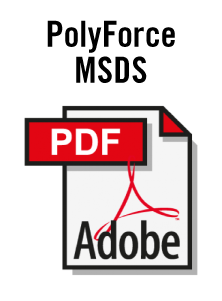 Follow the links below to all documents associated with PolyForce™ STRUCTURAL RECYCLED PLASTIC LUMBER.